In 2011, it was hard to visit a book blog without hearing about Amanda Hocking or her books. And while I found myself interested - especially in the Trylle trilogy - I decided to wait to read the story until the books were republished by St. Martin's. I figured it'd be best to read the final product - as you never know what will change with editing - but I'm happy to say that I get it now. I get why people are drawn to her books. Hocking has a way of pulling you in with her words. "Switched" is about a young girl named Wendy who was attacked by her mother when she was six years old. Her mother, Kim, swore that Wendy wasn't her child - that she was a monster. Everyone thought Kim was crazy, but Wendy soon discovers that her mother may actually be right. With the help of Finn, Wendy discovers who - and what - she truly is. In the beginning, I wasn't the biggest Wendy fan. She seemed like a spoiled brat. But as "Switched" went on and more was revealed about her - the attack by Kim and the non-existing bond she shared with her real mother - it was impossible not to like her. Considering she was nearly killed when she was six years old and she's just now discovering who she really is, her actions are understandable. As for the boys of "Switched": Finn, Rhys, and Tove. Seriously, I loved each and every one of them. Finn does give off a creepy vibe in the beginning (and I won't lie, I wasn't a Finn fan early on), but as a tracker, he's expected to protect Wendy, so his coolness and protective nature is just. I actually ended the book a Finn fan girl (something I wasn't expecting). And then there are Rhys and Tove. Rhys manages to look at everything with a smile - he's the perfect balance to Finn, who is usually all business. And Tove? I wasn't sure what to make of him at first, as he does come off as arrogant, but in the end when he comes through for Wendy; you realize he's not the arrogant jerk he comes off as. The characters were wonderfully written and the plot was unique, but what I found most captivating about "Switched" was the world that Hocking created. It was easy to get lost in her descriptions of this grand palace and this secret society of the Trylle. The world of the Trylle is unique and fascinating. The fact that it takes place in our world - although it's hidden from the public eye - is what I found to be most interesting, because even though you're entering this whole other world with trolls, you never truly leave the human world. Hocking's approach to trolls is something I found to be exciting. When you think trolls you picture either the toys you played with as a child - the ones with the fuzzy hair and gem belly buttons - or these large, hideous beasts. But in Hocking's world, the Trylle are beautiful creatures with magical abilities. I didn't think I could enjoy a story about trolls, but low and behold, I did. 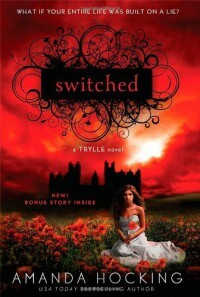 I'd highly suggest picking up a copy of "Switched" today. It's a truly unique tale that'll grip you from the very first line. I cannot wait to read book two, thankfully that'll be out next month, followed by the final installment in April. Just an FYI: each book in the newly republished Trylle trilogy will include a never before published short story.